We are located in the community of Franklin Park in the city of Pittsburgh, Pennsylvania. Goldens have always been a part of our lives, bringing joy, unconditional love, and patience. Casey was Melissa's first golden and started the love-affair with the breed. Since then, Melissa's family went on to rescue two more goldens, Laura & Bea. Gibbs is our first show dog and he has been a dream come true. He has beautiful movement and structure which has allowed Melissa to handle him completely owner-handled to his AKC Championship. Conformation has quickly become our hobby & passion. His son Jasper has been a fun and easy boy to show with his structure and movement and willing to please attitude. Since we have only our boys, we have no breeding plans at this time. In the future would like to have a breeding program that strives to produce sound dogs in their chosen venue from conformation, field, performance, to beloved family companions. 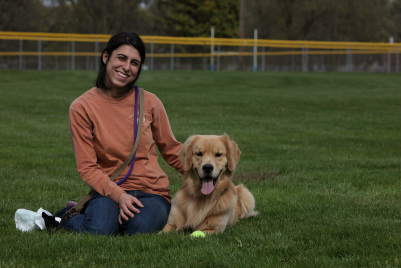 We are members of the Golden Retriever Club of America and the Greater Pittsburgh Golden Retriever Club where Melissa serves on the Board of Directors. We follow the GRCA's Code of Ethics and our breeding dogs, Gibbs & Jasper, have Orthopedic Foundation for Animals (OFA) hip & elbow clearances, a cardiologist heart clearance, and yearly eye exams by a board-certified ophthalmologist which are verifiable on the OFA database.